If you are looking for information on any 19th century medicine this is the place to look. There are also bottles for sale. A great site with great info and pictures. Check out Matt's new medicine book,it is for sale also. The top bottle magazine and bottle auction by far. "I've read the rest but I subscribe to the best." Mike polkas bottle price guide,digging story's and more.Check out the new 6th edition Antique Trader identification & price guide 2009.My digging buddy Paul and I are honored to take up a couple of pages in Mikes book's.Thanks for putting us in Mike. How to Tell the Age of a Bottle: by the Lips R.I P John you were the best. Rob Campbell and the "DUMP DIGGERS" A very interesting site with great digging story's. W&E is mainly a metal detecting magazine but it does have bottle digging story's in it from time to time. I recently submitted 2 privy digging story's in the 2012 April and June issues. A bottle digging and metal detecting forum. A metal detecting,relic and bottle magazine. With interesting story's and great finds. Note the disclaimer. "American Digger"
The Outhouse of America Tour. A fun site.Outhouse races & Outhouse digging. Brought to you by the travel channel. A very informative site.From a member of the glass bottle mold manufacturing industry. Great information on old NJ Glass Houses & More. 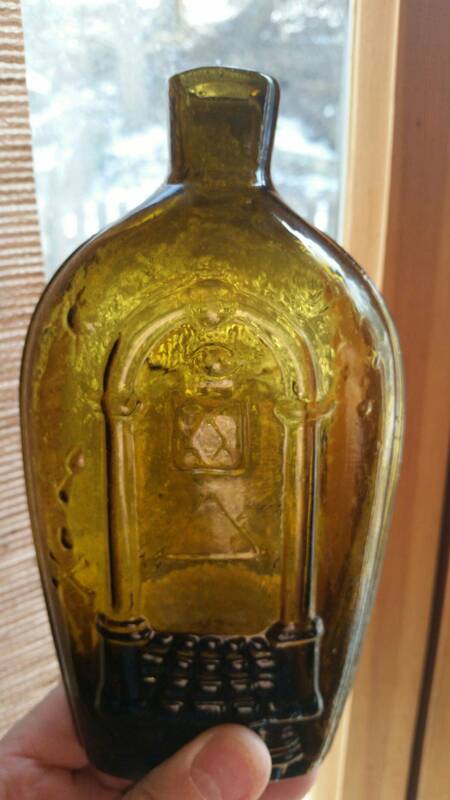 The place for Vintage and Antique Bottles.Plus a large list of bottle facts and related info. A site for the metal detector and the bottle digger. Glass making,Dating bottles Rarity and more. A large collection of English,Irish and Scottish hammed coins & tokens for sale. Wreck divers who uncover old glass from the bottom of the sea. Bottle Auctions,Dig story's,Pictures,show dates & more. A site for the bottle collector and the antique lover alike.No auction fees to deal with.Check it out, I am sure Mr Bottles will help you find what your looking. This site will help you find that unlisted bottle you have been looking for.It is also packed with tons of info on 19th century beers & sodas. A cool website with lots of information. The site has some interesting pages.Check out "bottle Humor" A great site for the beginner and veteran bottle enthusiast. Peachridge Glass wrote an interesting description of the color puce. A very cool and interesting site dedicated to marbles. There are some beautiful hand made marbles on this site. Recently a pink opaque lutz marble climbed to $25,000 at auction. please visit. A very informative site about pontil marks & scars. Myths & facts. Buy sell and trade. Antiques and Bottles. Top of the line. Story's and informative articles. A bottle site with very high end glass available for viewing. Great informative articles and other neat stuff. A site to go to when you need information on Historical glass. The owner of the site Steve Sewell is a friend of mind. He know s his old glass. Visit often for updates. A fellow bottle collector Tom Doligale has lost his battle with cancer. This was his web site. R.I.P TOM lets keep his spirit alive. Up close and personal pictures of the civil war. Some pictures are graphic. National Bottle Museum. Take a tour. An interview with Fireman jack about outhouses. A very informative site on Dyottville glassworks history. A very well put together site with a ton of great bottles and amazing information. A great site and a great magazine! A cool marble site! lots of high end marbles to view. Some good facts about Dyottville. Here is a place to buy probes for locating privies. If your thing is Egg bottles & Torpedoes this is the site for you! !